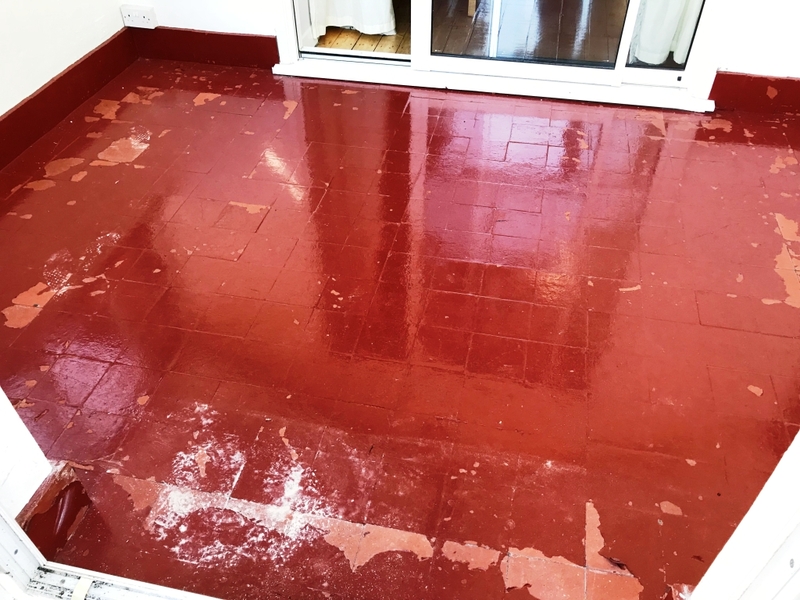 We suspect that the Old Quarry tiles laid in the conservatory of this Victorian house in Basildon, had been reclaimed from other areas of the property as the age of the tile didn’t match the time the conservatory was installed. 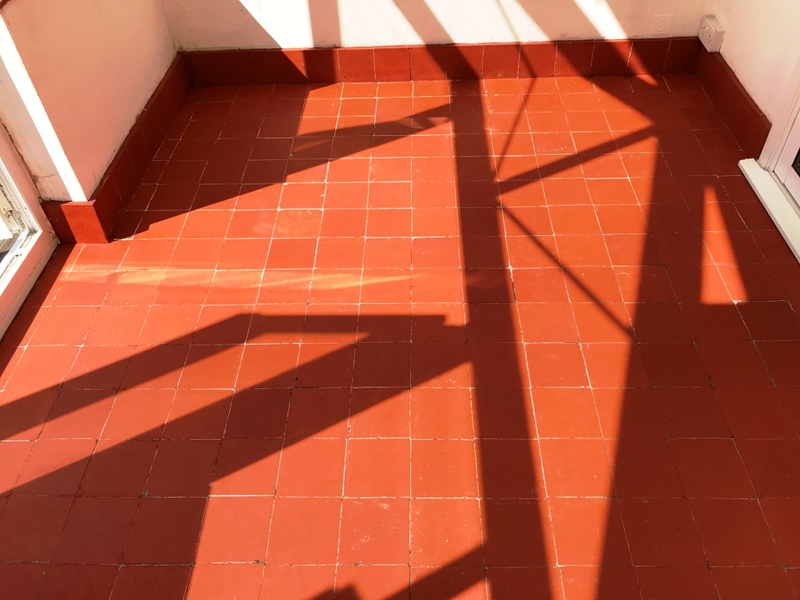 Not only were the quarry tiles old but they had been covered in layers of red tile paint by previous home owners. 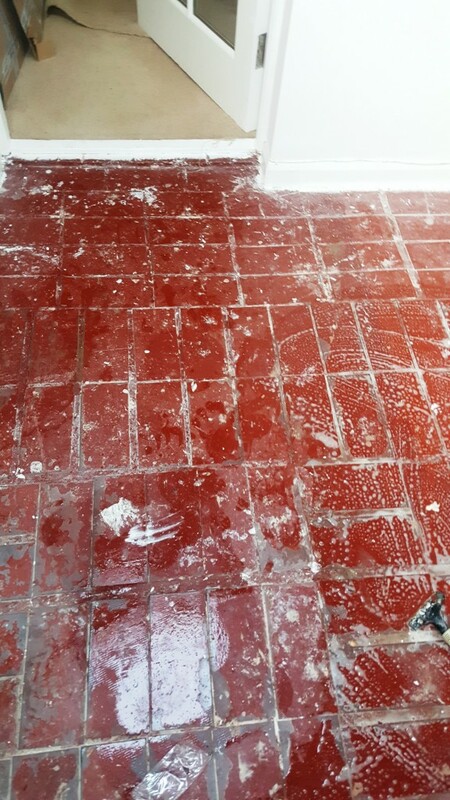 This had now begun to crack and chip and look unpleasant, so the customer wanted the old paint removed and the tiles sealed for a more natural look. I headed over to Basildon to take a look at the Quarry Tiled Floor; Basildon in Berkshire is not to be confused with the large town of Basildon in Essex, this Basildon is approximately 7 miles west of reading and is made up of the two small villages of Upper and Lower Basildon. 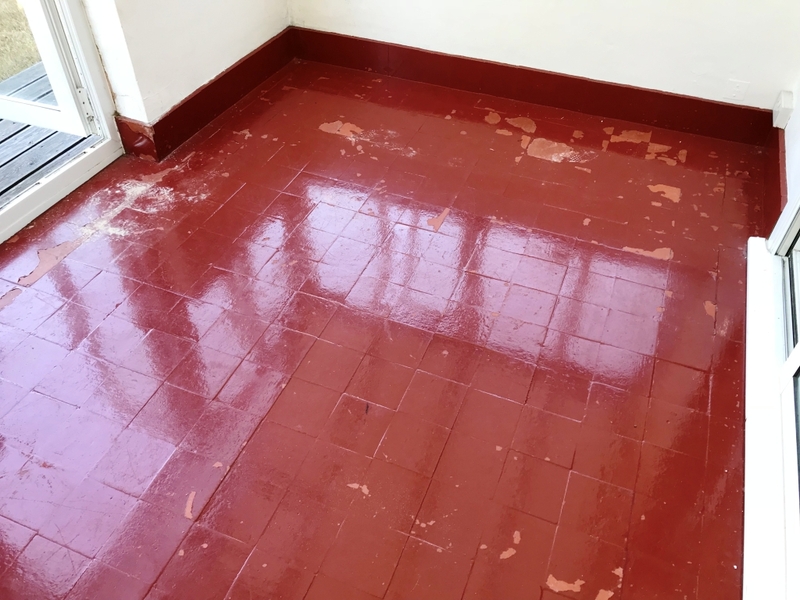 Having taken a look at the tiles and run some tests I was confident that the floor could be restored successfully I gave them a quote for the work, which was accepted, and a date agreed for me to return and get the work done. The first job was to tackle the layers of tile paint. Fortunately for me the paint had weakened over time and was fairly flaky in places which meant I could carefully peel away the dry paint with a blade attached to a scraper. This was a slow process but reduced the amount of mess that would have been produced if I was to use chemicals from the start. 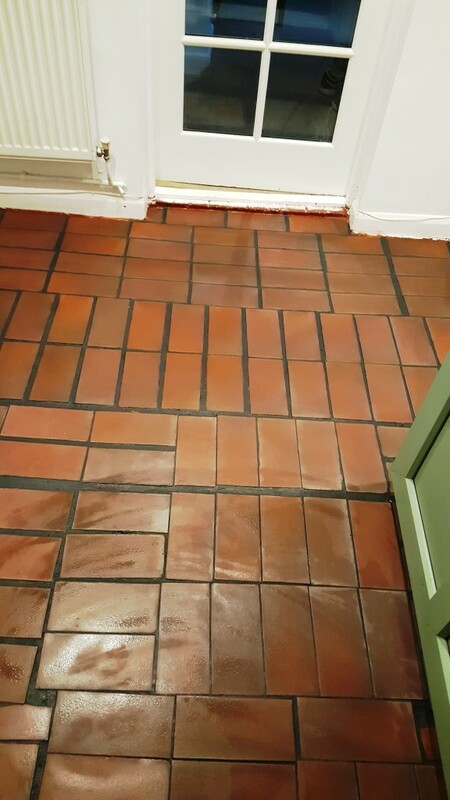 Once I had removed all I could by hand the remaining paint that had fallen into the grooves and grout joints had to be removed using a strong dilution of Tile Doctor Remove and Go which is a coatings remover designed for use on tile, stone and grout. The process worked well but I had issues with the product drying out due to the sheer heat in the conservatory (must have been 30 degrees and above!). 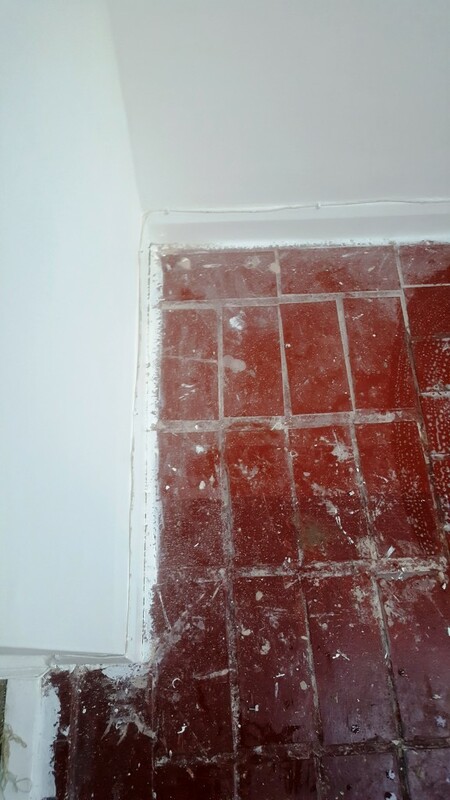 The Tile Doctor Remove and Go works best when it is left to dwell on the tiles for some time. 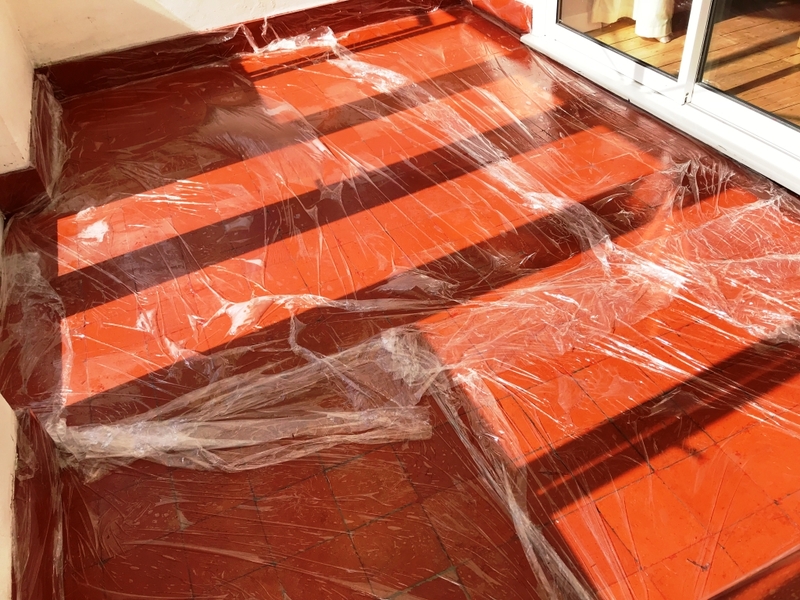 To overcome this obstacle, I applied Tile Doctor Nanotech HBU Remover and covered it over with plastic sheeting to stop it drying out too quickly. 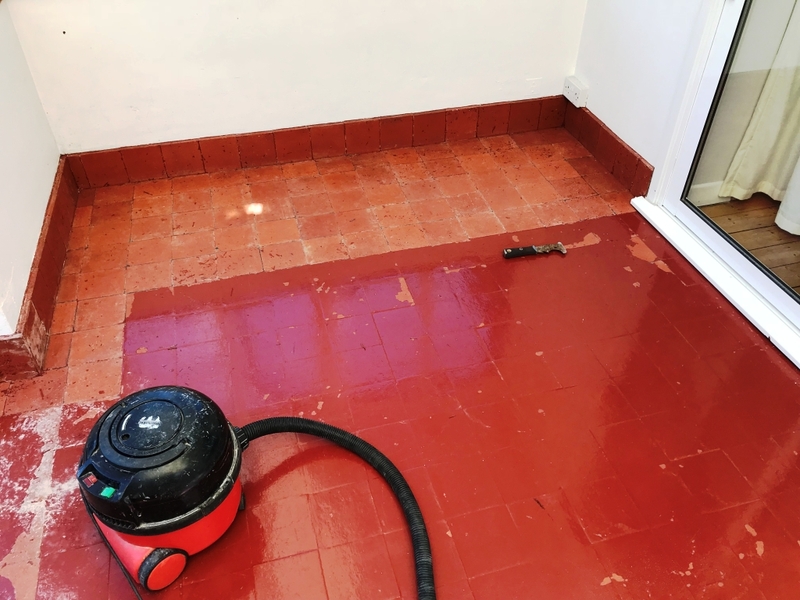 The HBU Remover which stands for Heavy Build Up, did the trick and after a couple of hours the tiles where ready to be cleaned using a black scrubbing pad fitted to a rotary machine and then rinsed off. 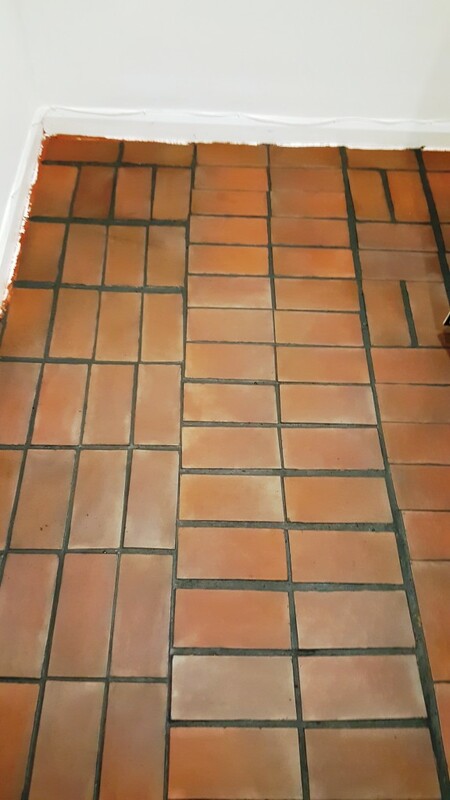 The soiled water was then removed using a wet vacuum and after a further rinse was left to dry off overnight. 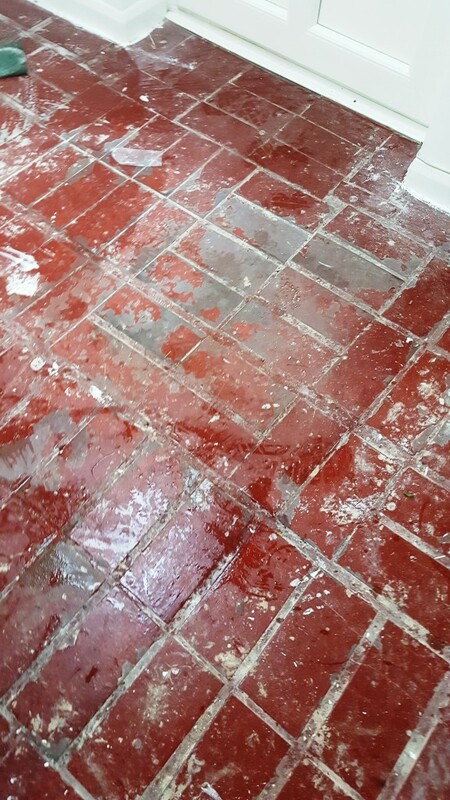 Thankfully the high temperatures worked in our favour and helped dry the floor out and when I returned the next day it was ready to seal. 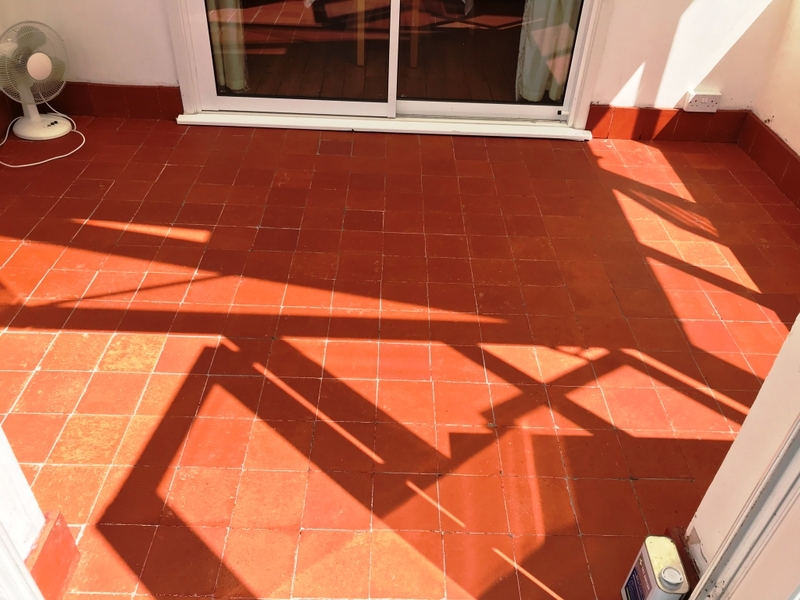 The customer had decided on a matt finish, so I applied three coats of Tile Doctor Colour Grow which is a impregnating sealer that leaves the desired finish and has the advantage of intensifying the natural colour of the quarry tiles.